Startimes subscribers can now watch over 100 channels on HD with the new satellite combo decoder that can work using either a Dish or an Yagi Antenna. The new decoder was just lunched by startimes to improve their service. How much is startimes COMBO Decoder? 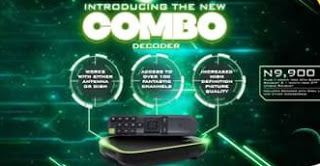 The price of the new combo decoder with Dish, LNB and other accessories cost just N9,900 + 1 month free DTH super bouquet & 1 month free DTT unique bouquet. Can I buy the Combo Decoder ONLY and How much is it? Can I watch EPL on my startimes combo decoder? Can I watch RIO Olympics on Startimes? Yes!, The RIO games can be seen LIVE on NTA Sports 24.